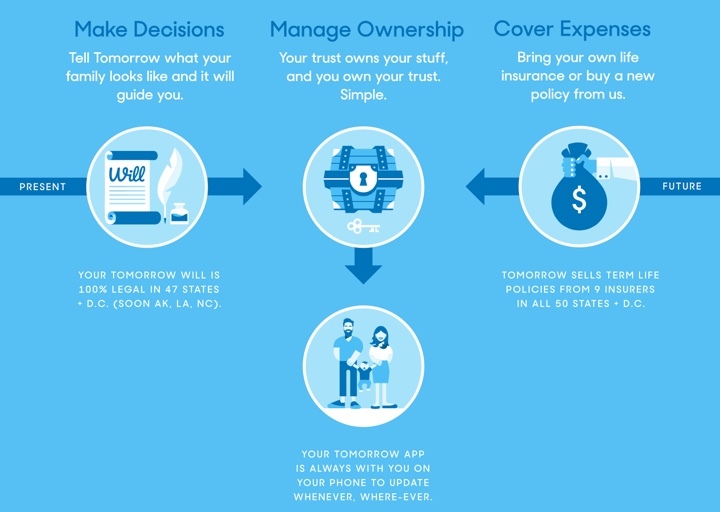 The newly-launched Tomorrow app brings estate planning to your smartphone. The app includes software that will guide you through the creation of a legal will and trust for your family, and it makes money by also selling term life insurance (which you can use to fund your trust). You can use the free will and trust feature on its own and buy life insurance elsewhere. More press at TechCrunch. Is this an adequate replacement for an estate lawyer? Estate planning is strange because it is so important, but people always procrastinate about it. Nobody wants to think about death. Meeting a lawyer can be intimidating and potentially expensive. So while you could argue about what is best, most people have nothing. Is it a positive to have free will & trust software that fits many situations, making it more readily available for the public? Can it provide a positive start to a conversation with family? I think so. Are there cases where an estate lawyer would create a better product customized to your personal situation? Certainly. Our wallet-watching cousins at the Consumer Reports Money Adviser newsletter took a look at three DIY options for will-making — LegalZoom, Rocket Lawyer and Quicken WillMaker Plus — and found that while all three are better than not having a will, none of them is likely to meet the needs of anything more than the most basic of estates. I’ve always been a little disappointed with legal software products when they say “we are not a law firm and this is not legal advice”. Okay, they probably have to say that. But really, if they are explicitly providing you with a ready-to-sign will and trust (and historically charging a fee for this service), then aren’t they… kinda… providing you legal advice? I certainly don’t understand it all on my own. I did download the app and poke around for a bit. I liked the mobile-friendly Q&A format (similar to tax prep software), but as I’m not a lawyer I don’t know about quality or whether it covers the proper scenarios. Competition. There are many established legal software websites that will guide you through the creation of a will and trust for a fee. For example, the LegalZoom Living Trust package includes a living trust, will, financial power of attorney, advanced medial directive, free revisions, and review from an independent attorney for $299. Willing.com currently offers a basic will for free (no minor children), but their cheapest package that includes a revocable trust also runs $299. A traditional local lawyer will certainly cost more than that, closer to $1,000 and up. It appears that Tomorrow hopes to subsidize this cost by encouraging you to buy optional term life insurance from them. I think this is a reasonable idea (assuming its not too hard of a sell) as term life insurance is also one of those things people regret not buying until it’s too late. Comparison sites like PolicyGenius life insurance quotes are helpful because premiums are the same no matter which broker or website you buy it from. That means Tomorrow can’t mark up the price. 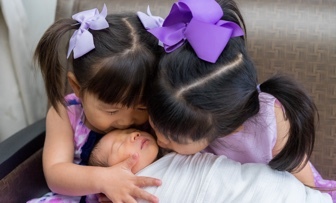 Our family already has a will & trust set up in-person with traditional lawyers. We bought term life insurance years earlier. On the other hand, I did use a software service to form my business (S-Corporation vs. LLC). Motivating myself to finish our estate plan was hard but I’m definitely glad we did it. I recommend getting something down in writing and starting the conversation, no matter which way you choose to do it. Those websites and services which provide wills, corporation formation, and other legal services tread a fine line. In essentially all jurisdictions in the US, non-lawyers cannot own a law firm or fee split legal fees. Thus, the LegalZooms of the world *have* to maintain that they are not providing a legal service or advice or else they will face the wrath of state attorney generals, the state bars, etc. Whether the LegalZooms of the world actually are not providing legal service or advice, which is defined differently in each jurisdiction, is another matter – for instance, attorneys who are recommended/listed with LegalZoom, agree to a flat fee, and pay LegalZoom a ‘marketing fee’ have been determined in some states to be splitting legal fees in violation of state law. All of this also ignores the liability aspect of LegalZoom et al. if they were considered providing legal services or advice – if a will failed for a number of reasons (with LZ, I’d be most concerned about the will not meeting basic state requirements), LegalZoom could be liable to the heirs/estate. Potentially arguments could be made as well regarding competence of the decedent to enter into a will, again with LZ being liable. Generally legal malpractice is a non-waivable liability, and a company with as broad of a reach as LZ would obviously want to avoid such liabilities. For a basic situation – no kids or kids beyond 18, no corporate assets, no trusts, no multiple marriage/half-kid concerns – an online will should be enough to get the job done for the meantime. However, wills despite their ultimate purpose ARE living documents until you die – kids happen, assets change, family circumstances change. Once things get complicated enough, you are doing a disservice to your family and to your own legacy intent by not utilizing a lawyer. As a lawyer myself, I’d want to ensure that I had the right trust situation setup and envisioned for minor children in the event my wife and I both died. Normally a living trust would include a “pour over will” but it’s not listed. Yes, the LegalZoom trust bundle includes the pour over will. If you go through the checkout you will see it listed. To Clarify my understanding is that a “Living Will” is the new name for the “Health Care Directive” where you specify whether you wish to be kept alive on machines or not etc. It’s mentioned in both the Last Will & Testament and the Living Trust packages. My understanding is that living will is a subset of possible advance directives (about whether you wish to be kept alive on machines etc). Other types of advance health directives include: durable power of attorney (someone else making your health care decisions), do not resuscitate order, and organ donation form. The app is iOS only, not Android.